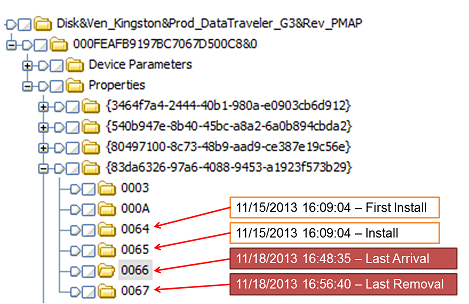 Tracking USB device insertion times has never been an easy task given that there is no direct timestamp saved by windows for this activity, ie, until Windows 8 arrived! This was a real pain in Windows Vista and 7 as dates and times were obtained from many different Registry keys’ Last Modified timestamps. And while this was reasonably reliable, timestamps thus retrieved always had to be taken with a pinch of salt! The picture below will make things clear. All timestamps are in the standard windows 64 bit (FILETIME) format. Comment- I have always seen Install Date and First Install Date to contain the same exact timestamp. My guess would be that it would only differ when a driver is re-installed or updated. Update- Harlan Carvey has discussed this issue and the above timestamps here. After some research, I was able to verify these details by looking into the Windows SDK. These properties have been defined in the include file ‘devpkey.h’. The last timestamp 'Firmware Date' has only been introduced in Windows 8.1 and I have not yet seen it in the registry. The term 'Last Arrival' is the one used by Microsoft, I will prefer calling it 'Last Insertion'. With this new information, we will have accurate timestamps and not need to jump through hoops for determining Last Insertion (arrival) and Last Removal times. There are a few other changes in the windows 8 registry which will be in subsequent parts of this series of posts on Win 8 Registry. That’s not all that changes when devices are inserted into a windows 8 machine. In the next article I will walk through all the windows event log changes. In case you are wondering, yes, there are plenty of events in the event logs for device setups/insertions/removals. These aren't new to Windows 8; these exist in Windows 7, as well. Harlan, Properties 66 & 67 regarding last insertion and last removal have only been introduced in Windows 8, and that is what this post is about. They are not present on a windows 7 system. I believe I have clearly indicated which ones appear in win7 and which ones in win8, what other way would you want me to explain it? Good to know someone's written about it. I had pointed out those keys (64, 65) to Mark Woan about a year back and he had acknowledged and subsequently added to his USBDeviceForensics tool which I think is the best tool hands-down for USB forensics. I have updated the post to include a reference to this URL now. i am krishna from cfsl,hyd. i hope u remembered me. i have a case of wherein the OSs are windows 2000 professional and windows xp. i could able to located the usb insertions in registry. but i want to know the timings of insertions. is it any way in thsese OSs. pl.advice. Good to hear from you, Krishna ji. These keys do not exist on xp or win2k. Sans has a good step by step procedure to get this information. Just google for 'sans usb forensics pdf' and the first few links will be helpful to you. Also I would suggest Nirsoft's USBDeview tool and Mark Woan's USBDeviceForensics. Hi, Yogesh. I just noted a Win 8.1 x64 system in which the USBSTOR does not include any value/data for the 0067 key for a portable hard drive. Have you seen this?